Sergei Skripal, the former spy who was poisoned with a Soviet-era nerve agent called Novichok, was released from the hospital today. But health officials stress that Skripal still needs more time to properly recover. Skripal, 66, and his daughter Yulia, 33, were both poisoned with Novichok on March 4, 2018 and were found unconscious on a park bench in Salisbury. The first police officer to attend to them was also treated for being exposed to the nerve agent. British authorities believe that Russia was behind the poisonings, something that the Russian government denies. “While these patients have now been discharged, their right to patient confidentiality remains and limits us from giving detailed accounts of the treatment these individuals received,” a Salisbury District Hospital spokesperson in a statement. The hospital stresses that there will be more recovery necessary “away from the hospital.” It’s unclear at this point where Skripal will be living. His home, believed to be the place where he and his daughter were poisoned, was sealed off as a crime scene. Yulia was moved to an undisclosed “secure” location after her discharge from the hospital on April 10th. “Treating him and the other two people poisoned by this nerve agent, while still providing outstanding care to the other patients who rely on our hospital, has been a huge and unprecedented challenge that I’m proud our staff at Salisbury Hospital have risen to,” Lorna Wilkinson, Director of Nursing at the hospital, said in a statement. The poisoning turned into an international incident, as British officials insisted that Russia was behind the attack on British soil. But Russian officials continue to float every possible conspiracy theory, claiming that Russia had nothing to do with Skripal falling ill.
Russia even claims that perhaps Britain poisoned Skripal as a false flag attack to make Russia look bad. Russia has also taken issue with Skripal being called a “Russian spy” in British newspapers. Skripal was a double agent in Russia passing secrets to the British before he was arrested by the Kremlin in 2006. 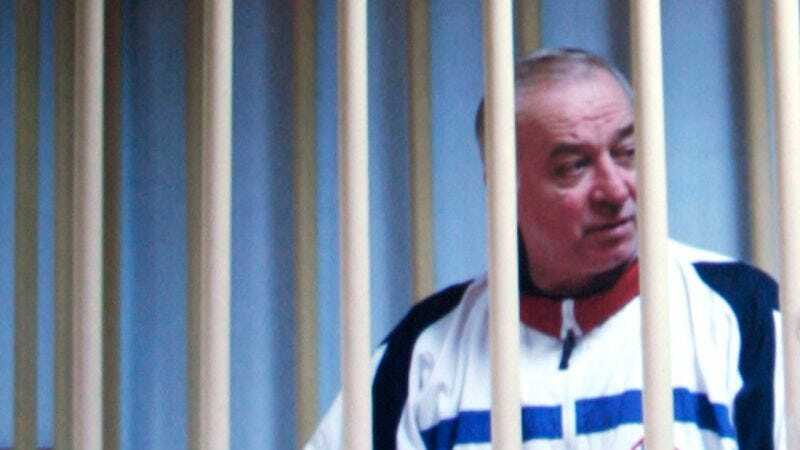 Skripal was released to Britain during a prisoner exchange in 2010. Since the poisoning, it has been revealed by news outlets like the New York Times that Skripal was “retired,” but still consulting with various governments about spy technique. Skripal had reportedly met with both Estonian and Czech intelligence officials as recently as 2016. It’s not unusual for former spies to do consulting work, but the fact that Skripal was still active in the world of espionage points to a possible motive for Russia beyond his original betrayal of the country in the early 2000s. Recent photos of Skripal and his daughter haven’t appeared in any media outlets since the poisoning and Russia has complained that it doesn’t have access to Sergei or Yulia, both of whom are still Russian citizens. But it seems unlikely that Russian officials will have a chance to see them anytime soon.